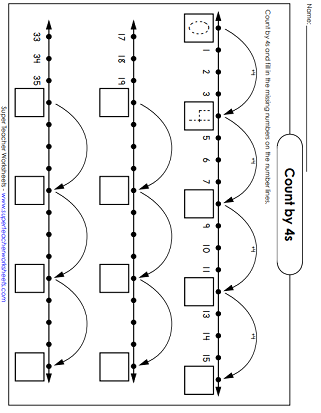 These printable worksheets can be used to help kids learn to count by 4s. Count 4, 8, 12, 16, 20, 24, and so on. On this number line, students learn to count by 4s up to 48. 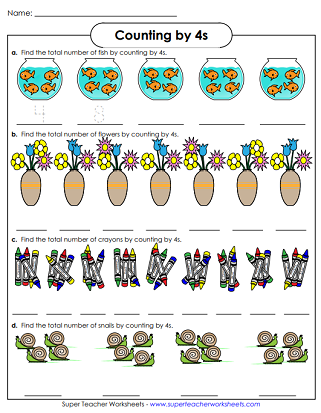 Count by fours to determine the number of snails, fish, crayons, and flowers. The penguin groups have multiples of four on their bellies. Skip count by 4s to complete the numbers. Kids can count by 4s by writing numbers in the empty squares. The page features skiing graphics. Up and and away! Multiples of four are listed on these balloons. Keep counting by 4s (up to 96) to continue the pattern. 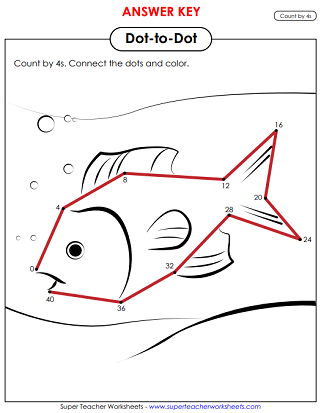 Count by 4s and connect the dots to make a picture of a fish. Start with number 0 and go all the way up to 40. Students answer a series of questions about skip counting by 4s. This rocket needs to reach the star. To get there, count by 4s. The first circle starts at number 4 and ends with 40. Fill in the caterpillar as you skip count by 4s. Color every 4th number on the hundreds chart. View the full skip counting index to find worksheets related to counting by twos, fives, tens, and threes. Hundreds charts are terrific tools for teaching students about counting and basic place value. Count by ones with these printables. Includes two and three digit numbers. Review counting by ones up to twenty. Practice identifying even and odd numbers.